It's instinct. Women have been doing it for thousands of years. In the Stone Age it was bronze metal working. In classical antiquity it was marble anything. In the middle ages it was... well really I have no idea. But I know that for many women it's instinctual. It's built into our psyche. When we are frustrated. When we are sad. When we are hurt. We do it. We indulge in retail therapy. And it's not just for the lows. When we overcome something. When we reach a goal. When we are celebrating. We do it then too. And this week... I am SO guilty. Old Navy was having a sale, and I had a coupon so I indulged in an online purchase of some new clothes and a ring. Then I went to Kohl's to pick out a dress for a wedding I'm attending and left with a dress and a gorgeous new handbag. But a handbag is a necessary item, right? And they are useful. And it's a great accessory. And... and I wanted it. Over the last few weeks I have been having an inner debate. To nook or not to nook. To iPad 2 or not to iPad 2. Nook color or not to nook color. Kindle? Sony Reader? On my iPod I've been getting free ebooks from Barnes and Noble. I now am up to almost 80 books I think. But it's hard to read a book on an iPod touch. 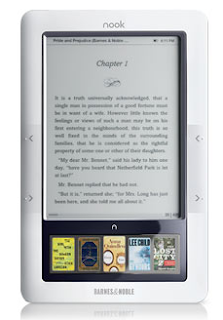 So I was debating between an nook or an iPad. Oh what to do. Well, then life happened and I needed some retail therapy. So I went to Barnes and Noble and bought the nook. And a cover. Holy crap! It took me a good half hour in the store to make the decision. To decide 100%, or as close as I could get, and to choose a cover. I'm sure my friend who I asked to come along was laughing at me. But for me, it's hard to make bigger purchases. Especially when my bank account is painfully low. Painfully. So I bought it. Set the bag on my desk, and left it there. For hours. I couldn't open it. Because once I opened it, it was mine. No going back. Finally I had to just do it. Holding it away from me, eyes almost closed like it was a dirty diaper or something that I didn't want to see or hold. But I did it. And I've used it a little. I'm sure over time I will come to love it. This weekend I need, well need/want, to go get another pair of sandals that I really like and some leggings. More money. But, for now, it's the fact that in the last week I've dropped a large amount of money on retail therapy. But it's therapy, right? So it's beneficial? That's what I'm telling myself. Because I LOVE the handbag. I'm still waiting for my Old Navy package to arrive. And I'm learning more about my nook every day. I still haven't decided if the cover I got is for me. But I apparently have 14 days to decide. Which is awesome. So hopefully, my indecisive mind can finally decide. Have you ever indulged in retail therapy? Could you afford it at the time? What did you get?